This spacious double storey home has a separate fully fitted kitchen with granite counter tops and space for a fridge, washing machine and tumble dryer. There is a separate dining room with cupboard space and granite counter tops with a nook adjoining to the kitchen. There are two ensuite bedrooms on the first level with built-in cupboards. Separate lounge with sliding door leading to spacious balcony. On the second floor is a loft area and 2 separate bedrooms (one ensuite) each with built in cupboards. Upstairs bedroom has sliding door leading out into large balcony. Double garage with automated doors and visitor parking bays. 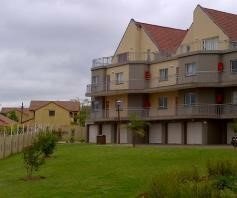 The townhouse is situated within a secure complex which offers two squash courts, braai area, swimming pool, beach volleyball area and a jungle gym area for children. Rent excludes all electricity costs. Deposit required and rent in advance before occupancy. Available 1 December 2016.